The Foster City Lagoon is a great place for model boat racing. For example, see this video of IOM radio-controlled boats racing at Leo J Ryan Park where the central lagoon is located. In May 2015, 5/8/15 – 5/16/15, the best in the world will race here in the International One Meter (IOM) World Championships. Last May we also enjoyed the National Championships so world-class model boat racing in Foster City is becoming a regular event. For more information see 2015 World Championship Regatta. 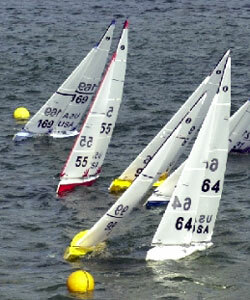 Here are some links to pictures of a smaller regatta held in Foster City during 2013, the U.S. IOM Class Association and one meter yacht class rules. Also see more Foster City Events including an El Toro Sailboat Race being held at the same time (i.e., 11 am, Saturday 5/9/15).